Guy Fieri knows exactly how to fire people up, so you can imagine how thrilled her audience was when he joined The Rachael Ray Show! The enthusiastic, blonde-spiked chef explained that one of his favorite ways to make the most of his time in the kitchen at home, is to make a large amount of meat, like a Pork Shoulder, and then use the leftovers in a couple more meals throughout the week. 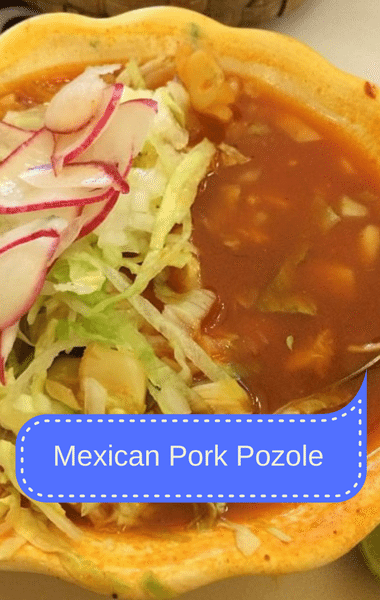 Like Guy explained, you can make the Pork Shoulder on a Sunday, have tender shredded pork sandwiches for dinner that night, and then Tuesday or Wednesday you can make a dish like his Mexican Pork Pozole using some of the leftover pork! Really, does it get any better than that? Trust me, you’ll want to start cooking right away! Click next page to get the recipe. Pour canola oil into a deep cast-iron skillet to a depth of 2 inches and heat over high heat to 350°F. Line a plate with paper towels and set it next to the stove. Working in batches, fry the tortilla strips in the hot oil until crispy and golden brown, stirring often, 1-2 minutes. Using a slotted spoon or spider, transfer the strips to the paper towels. Season with the remaining 1 teaspoon of salt and set aside. Serve the stew, garnishing each serving with the avocado, cabbage, radishes, jalapeños, green onions, cilantro and crispy tortilla strips.